The Proweave Sportsvac which is recommended by Dales Sports is a triple motored industrial vacuum cleaner with a cleaning path of 28 inches and with 5 optional height settings will clean your bowls carpet whether it is brand new or 20 years old! Clubs that are already using this vacuum have found that the cleaning results have been quite amazing with cleaning times reduced and an enhanced appearance to the green itself. Operators find the vacuum easy to use and with semi traction caused by the turning brush roll is almost effortless to push along. For a deep clean of the bowls carpet described in ‘Cleaning the Carpet’ each rink will take approximately ten minutes to clean or if you decide to give the carpet a quick ‘once over’ the cleaning time can be reduced further to about six minutes per rink. One of the bowling clubs greatest assets is of course the carpet itself. With replacement costs of the carpet and underlay running at about £ 5000.00 per rink it is no wonder we do not allow running on the green or any drinking or eating anywhere near the playing surface. Clubs by introducing a proper cleaning regime with a Proweave Sportsvac can extend the life expectancy quite significantly and if this forestalls the day the carpet has to be replaced by a number of years this has to be a good thing for the club and its long term financial viability of our wonderful game. 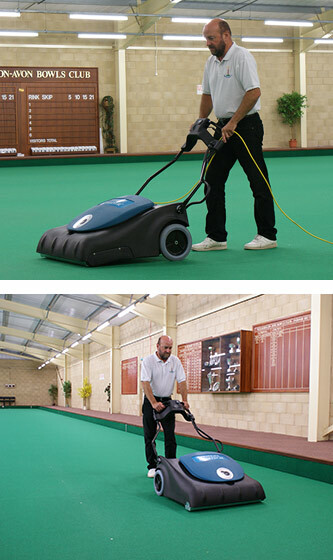 With indoor bowls carpets the greater majority of debris collecting on the green is a mixture of airborne dust, chalk powder, bits of paper tissue, threads of clothing, human hair and particles of skin. The small particles tend to work their way through the open weave carpet but the clothing threads and bits of paper tissue sit on the surface and because of their fibrous nature become inter twined with the carpet fibres itself. This is compounded further by the fact that all this debris tends to be held by the carpet through static retention and make it exceptionally hard to clean using conventional vacuum cleaners. Without regular cleaning and we would recommend that this be done on a twice weekly basis, you will find that the carpet begins to look unsightly with a build up of surface debris at the ends of each rink. More importantly the airborne dust drawn to the carpet and chalk powder around the heads become compacted by the constant footfall and this is most noticeable in the top and bottom two panels where most of the activity level takes place. If this process is allowed to continue unabated a bruising like effect will develop in the areas where bowls constantly hit the compacted dust and inevitably compact it further. It then becomes harder to clean these areas and they begin to look prematurely worn and tired, which will necessitate in either a total clean of the bowling surface, a turning of the carpet or at worst total replacement. Without regular cleaning there is also a significant increase in the risk of carpet piling which is where the carpet fibres twist and create a small nodule which in turn can affect the smooth running of the bowl. Using the navigational aids at the head of the page you can find out more about this vacuum cleaner and how it could benefit your club.